Brendan's new Facebook & YouTube pages. Like, share & enjoy today...! "DOHERTY" - A Luke Malone, Alone Wolf Pictures & Semi-Rebellious Films production featuring Brendan's original hit song, "Tiocfaidh Ar La" (Our Day WIll Come) as it's theme tune. GOLD at the Elevation Indie Film Awards in Dublin & GOLD at the California Film Awards! ERIN - 51 minutes of pure, heartfelt Irish magic from KAMA "Male Artist Of The Year 2015" award winner and one of Irelands' very last Patriotic (Rebel) Song performers. The new album from Irish native Brendan Loughrey features 13 wonderfully refreshing original songs. His distinctive powerhouse vocals, unique lyrics and utterly instinctive guitar work have yet again combined to "raise the bar". 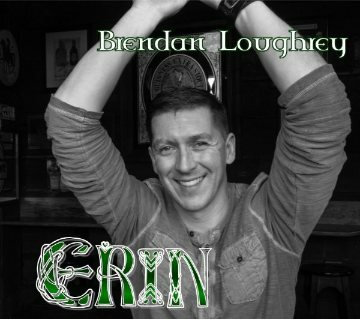 Erin is easily Loughrey's finest work to date, and this is very simply an album that must be included in each and every Irish/Celtic music collection worldwide. With Bart Cason on Percussion, John Lardinois on Violin, Adam Gueth on Bass and Leo Butler on Bagpipes/Whistle, these songs are emotive, honest, heartfelt and memorable. Loughrey's un-nerving ability to convey the meaning of a song to the listener is not something which can be taught or learned. The stunning "Pack Your Bags" is an absolute MONSTER of a tune, the opening track "Tiocfaidh ár lá" (translates - Our Day WIll Come) will feature as the theme tune to the upcoming movie "Doherty". Others worth mentioning are the the heart-wrenching "Another Year" written for his brother Barry and the angry and vitriolic "Jack". "Tattooed On My Tears" is a magnificent track and the final song "Old Ireland" ends the album on a gloriously positive and upbeat note. From start to finish there is truly not a solitary weak song on this entire record. Loughrey's fearless writing leaves the listener in no doubt as to his love and loyality for his Ireland and I must mention the haunting "Most Days", a daring song addressing childhood sexual abuse survival. As Loughrey says, "Someone's got to talk about it". Not many albums appear on the shelves these days that actually have something to say Ladies & Gentlemen, but Erin does, there is a lot to be heard and learned from this album and I'd highly recommend that you pick up a copy for yourself and maybe even one more for a friend before this day ends. Simply a wonderful new album from Brendan Loughrey, ERIN. Break on Through: The Life & Death of Jim Morrison.